Holiday Ecommerce Prep: 5 Things You Should Be Doing Now! If you’ve weathered at least one season of online retail commerce already, you know the drill. If you haven’t already started planning out your Holiday sales season, now is the time! Here are some things you should be thinking about and setting up right now in order to make the most of the single biggest retail sales season for ecommerce. If you were in business online last year, did you have enough people as well as physical resources to fulfill orders in a timely manner? Even more so than during other times of the year, customers want and expect delivery on-time during the Holidays! Don’t be the scrooge that ruins people’s holidays. Make sure you have enough people, boxes, and packing materials to handle the business you can reasonably expect. Look at the calendar and plan ahead delivery windows. When do people have to order by to expect delivery before major the major Holidays – Halloween, Thanksgiving, Hanukkah, Christmas and New Year? When will they need to place orders via expedited delivery? Will you offer expedited delivery? Work these rules out, then make sure they are posted prominently on your website. If it is at all possible, try to offer some level of Free Shipping. It is a sad fact that most small to medium sized e-retailers must sacrifice some profit in order to compete with ecommerce giants like Amazon. Can you offer a low flat rate? Can you offer free shipping on certain items or on orders over a certain amount? Consider leveraging your shipping process for further marketing. Can you include coupons for your customers’ next orders? Promotional materials for new arrivals? Sneak peeks at upcoming sales or “exclusive” sales? This is your chance to turn new customers into loyal, repeat customers. Up-sell! Offer the matching pants or accessories; suggest batteries or necessary cords/add-ons. Suggest related items that would make the perfect gift bundle – for instance, a blanket and stuffed animal to go with those new baby pajamas. 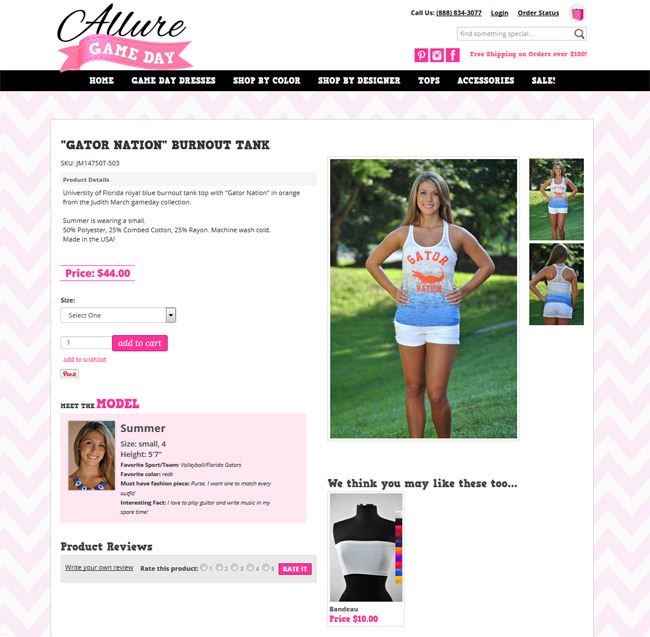 Game Day Allure offers the bandeau to compliment their burn-out tank as a suggested add-on purchase. 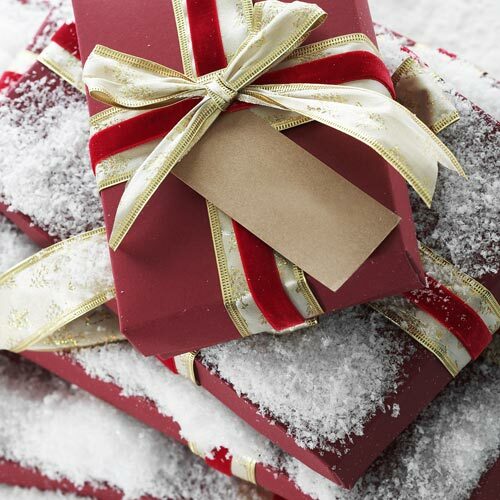 Create a “Gift Guide” that organizes your products according to their perfect gift recipient. In the most basic sense, this might mean “Gifts for Women,” “Gifts for Men,” and “Gifts for Children.” You might also go further and present “Gifts for Movie Lovers,” “Gifts for New Moms,” etc. based on your products and target customers. Not only does this help your customers shop your site, it also create relevant, sharable search engine and social media content. Put together “Bundles” of products that offer a discount price if purchased together. Not only do people love discounts, but they also love when you make it easier for them to put together great, unique gifts. In ProductCart, bundles are a special type of cross-selling relationship and can be managed in the same place. If you have a blog, create some “curated shopping” pieces, reviewing products in depth, providing friendly shopping recommendation, showcasing collections of products that go well together, Holiday tips relevant to your target shoppers, and more. 5. Think About Your Marketing! Email campaigns – If you have a healthy email list, now is the time to start putting together and scheduling emails to your customers and subscribers. You might want to consider exclusive deals or coordinate with. Sales & Promotions – Plan out the sales and promotions you will include in your Holiday sales season – items, offers, time frames, etc. Social Media – Be ready to generate interest and traffic through social channels. This might be through “free” or organic campaigns on Facebook, Twitter, Instagram, Pinterest, and more. It might also mean planning out paid campaigns. Facebook, Twitter, LinkedIn, Tumblr and other social media channels offer opportunities to reach potential customers via paid advertising and promoted content. Retargeting – Look into a retargeting campaign to display ads to customers who have visited your website, enticing them to return. You can use a third-party service like AdRoll, or retarget directly through Facebook or Google. Abandoned Cart Emails – Consider adding an abandoned cart program to your website that allows you to send a reminder to customers who started a cart but did not complete the purchase. Pay-Per-Click Campaigns – Even if you don’t advertise via PPC during the rest of the year, you might consider limited or very targeted PPC campaigns on Google or Bing during the Holidays. Cross-promos with other stores – consider a promotional event, giveaway, or other opportunity to cross-sell with a related but non-competitive website (for instance, if you sell gaming consoles consider partnering with a company that sells man-cave furniture).